I like food! I like guests! Stop by every Friday to see what my friends and I are cooking up. Will it be haute cuisine? Will it be something we made from left-overs and that thing we found in the freezer? There are no rules, it’s just about the food. Tired of turkey yet? Alice Orr is here today with a great cold-weather recipe you can easily make in the slow-cooker! Make sure to check out Alice’s new book A Vacancy at the Inn! I grew up in the Snow Country. Extreme northern New York State almost to Canada. The white world of winter – white snowscape meeting white sky. I loved the crisp cold beauty and the solitude of it where a young girl could be truly on her own. My mother was strict but she’d never go out in the biting cold or the blowing snow to track me down. Once I was through the front door of 439 East Avenue I was literally in the wind and I wouldn’t return home until suppertime. Mom wasn’t a great cook but he was a good cook. She was especially good at winter cooking. In other words substantial food. “That will put meat on your bones,” my dad would say. He was almost always referring to a pot of something set to simmer on the back of the stove all day long. Soups and stews and spaghetti sauce were the most frequent occupants of that pot. It wasn’t a fancy pot because we weren’t fancy people. We didn’t care what the outside of the pot looked like. We cared what its contents tasted like – and how they made us feel. On a cold winter day the pot fare from my mother’s kitchen made us feel – first of all – warm. We ate in the dining room but we could smell the aroma from the kitchen that had our mouths watering even before the steaming bowls were carried in and set down in front of us. Then we’d eat – quietly for a while because we were so very hungry. Then gradually we’d discover the other thing those cold-weather pot meals made us feel. They made us feel full. Flash decades forward to my kitchen. We live in the northeast – not as far north but it still gets very cold here. My husband Jonathan is a contractor. He runs time-pressured jobs for demanding people and he comes home hungry every night. In the winter he comes home hungry and cold. We live in an apartment building on the second floor. Jonathan walks that one flight up each night. As he climbs the aroma of my kitchen draws him home. He drops his jobsite boots at the door – shakes the snow from his work jacket and leaves the outside world behind. “I could smell your cooking all the way,” he says as he folds me into his still chilly arms that feel warm as toast to me anyway. Then he lifts the lid of the pot and takes a long deep whiff. He is continuing his aroma experience but what he’s really needing is substantial food. 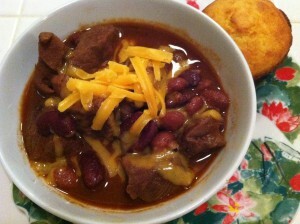 Chili Mole is substantial food and one of Jonathan’s favorite cold-weather pot meals. I simmer it all day long – just like my mother back on East Avenue but I use the slow cooker – my best meal preparation buddy on long winter days. Here’s my recipe. Give it a try. And stay warm. Since it is release week for You Can Leave Your Boots On, I thought I would bestir myself to write my own #FoodieFriday post featuring something from the book. Bo loves a Porterhouse. That sounded good. There are lots of methods for cooking steak on the interwebz, including this crazy freeze-fry method, which sounded like way too much effort. Hmmm… maybe I could get Bones to do this for me instead of actually doing my own work. (Have we discussed how lazy I am?) This turned out to be the easy part. 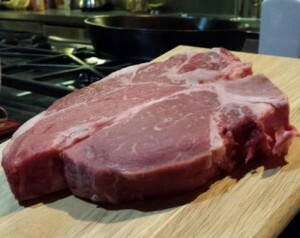 Like Travis, I don’t often offer to bring home 2 lb chunks of red meat – Bones couldn’t quite pull off blasé as he agreed. You know, as a favor. Just because he loves me. This is a simple method for cooking almost any steak and it doesn’t require a grill.